Don’t Be Green, Let Your Fish Be Seen! Green water is the most common problem with UK ponds. Made up of millions of microscopic algae spores that cause a green tint to the water. This tint can range from a murky, swamp green, to a vibrant, almost luminescent green. Fortunately, whilst the problem may look disgusting and daunting, with the help of green pond water treatment and the power of bacteria, it is relatively easy to fix and even easier to prevent in the future. Pond Klear contains millions of beneficial bacteria that target the microscopic algae spores, clump them together and digest them, to eliminate green water. Whilst targeting the algae spores directly, Pond Klear also focuses on eliminating the unwanted organics that feed the algae spores. Decaying fish food, leaves and the worst contributor, fish waste are these kind of unwanted organics. Unwanted organics emit harmful toxins that pose health risks to fish, which is why Pond Klear was developed. By removing toxins from the water, oxygen levels are increased, and fish will become more active and happier. You never know, they may thank you one day! 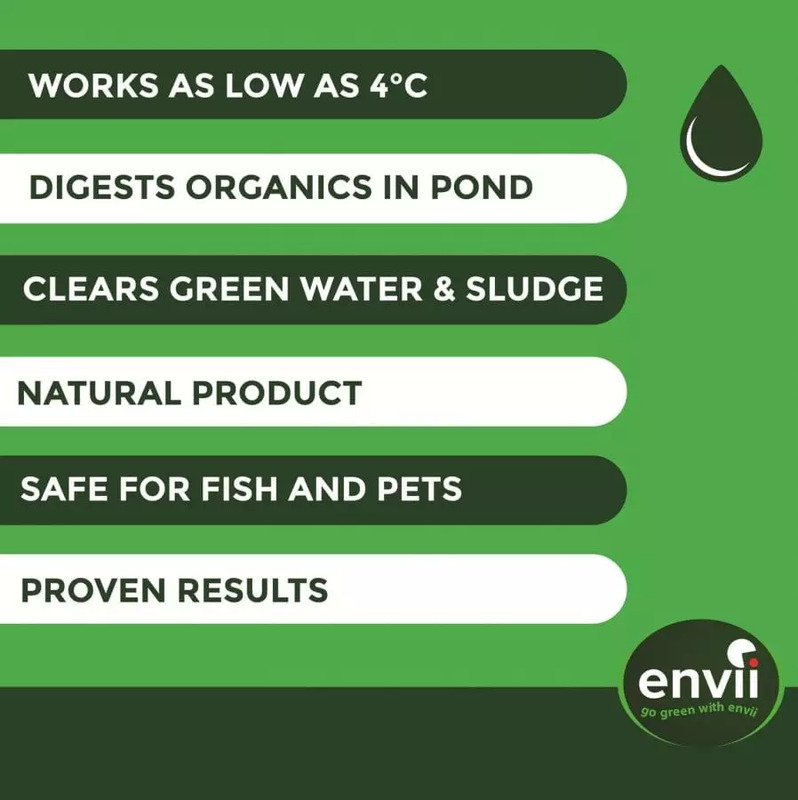 Pond Klear is the UK’s most trusted green pond water treatment with good reason. Containing innovative bacteria that work down to 4°C. This gives Pond Klear a very unique advantage over other treatments. Most other treatments only work down to around 12°C which gives algae a window to sneak in a little extra growth. Algae grows down to temperatures of 8°C, so if the bacteria can’t work that low, there is nothing to fight off the algae spores. Whilst the main focus is to eliminate green pond water, it also suppresses the growth of blanket weed and string algae. However, if you are wanting to get rid of blanket weed, we recommend Blanketweed Klear. For string algae, we recommend Algae Klear Xtra. For ponds over 20,000 litres, use Pond Klear Xtra which is three times stronger than our standard Pond Klear. Before using any bacterial treatment, we recommend either checking the pH and KH level in your pond or using Pond Equaliser. This instantly stabilises the water parameters and create the ideal environment for fish and bacteria. Be sure to check your pH before using Pond Klear as an imbalanced pH can impact the products performance. Yes, Pond Klear is a natural product that is safe for all fish, plants and wildlife. Does this work in ponds without filters? This will work in ponds without filters but may take a little longer to clear them. For a quicker results, consider using Natural Pond Klear.